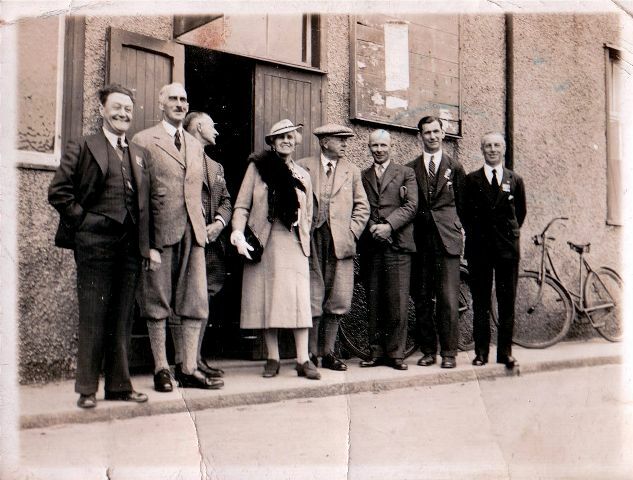 Judging by the clothing and bikes I would think this is a pre war photo. The clothing also suggests that there may not be a British Legion connection. Plus fours were not normal dress for ex soldiers..unless of course they were officers!Could this actually be outside the old YMCA? I wonder if the woman turned up on the bike!!! I think you are correct Billy. Think it's the old YMCA. Legion was up on the High St. Yes Harry, the second name for these daft trousers was always used in our house. Definitely the YMCA, the door to the dance hall. Can anyone confirm that the YMCA was laterly known as The Grange? I remember a large building at the end of Clyde Street that burnt down in the late 70s/early 80s. It was a lovely old building with a large wooden porch area at the front that used to remind me of something out of the old American wild west films!! Jillian B, you are correct. The YMCA became The Grange, it provided food and accommodation for people working in the area. Jillian ..yes the YMCA was renamed the Grange by a family from the "Grange" area around Keith I believe. The family concerned were MacGreggor to name and one of the sons Rob took over Joe Angelo's garage in Ross Street around 1963/65 and called it Rob Roy Motors. Hi Jillian, you are right, the YMCA became The Grange in later years. I remember all the terrific dances which were held in the YMCA hall, particularly when the Fleet was in and the Marine band played. Happy Days!!!! I remember the Grange being used as a one day/weekend type salesroom by some firm from down south, probably early '70s. Thank you all for your replies. I wondered if it was the same building. We used to live along the road from it on the corner of King Street/Outram Street. I remember thinking what a shame it was destroyed and never rebuilt - it's a car park now (like quite a bit of old InverG! )- very sad! !